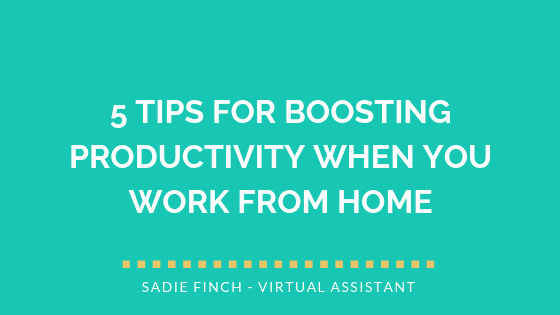 Now that we’re all (slowly) getting back into the swing of things after the summer, I wanted to share five of my best tips for increasing productivity when you work from home. The summer has been fun and full of memories, and I wouldn’t change it for the world. It was such a privilege to spend so much time with my boys over the holidays, and now that they’re back at school, it feels kind of lonely around here. Lonely, but oh so quiet and peaceful. 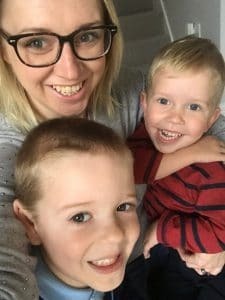 Working from home comes with many benefits, especially when you’re a parent, but I’d be bending the truth if I didn’t admit that it can sometimes be a struggle. The lines get blurred and it can be difficult to set and stick to boundaries. Here’s how I deal with it. If you’re lucky enough to have a home office, that’s ideal. If space is lacking, try to at least carve out your own corner that’s exclusively for work. Turn your back to the rest of the room to help you narrow in on what’s important, and keep the area free from distractions. A clean and tidy workspace can help many of us feel calmer. While studies have shown that a messy desk can actually improve creativity, I’m of the thinking that a tidy desk = a tidy mind. The tidier your mind, the more able you’ll feel to get through your task list without distraction. Personally, I’m at my best when I have a strong routine, and I feel way more productive and in control when I have a clean, tidy, and well-organised working environment. No surprises that that’s ten times easier to achieve without my two little Mess Monsters running around all day! You may have joyfully waved goodbye to the outdated and unfair tradition of a 9 – 5, but that doesn’t mean routine isn’t your friend. A routine can be whatever you want it to be, and it doesn’t even have to be the same each week. Find one that fits around your other responsibilities, and then do your best to stick to it. When you’re working to a schedule that’s built around your life (and not vice versa), you should find that you have more energy and enthusiasm for your work. IPSE’s 2017 ‘To Be or Not To Be a Freelancer’ report showed that one of the top three reasons behind freelancer’s decisions to go solo was for a better work/life balance. I’d argue that balance is the wrong word. It’s not about working less and living more, but about being able to blend the two more comfortably. Stop believing that there’s a perfect world out there in which your work and home lives can exist separately. Sometimes you’re going to have to blend the two, and that’s okay. Get comfortable with replying to emails on the go or engaging on social media while you’re cooking dinner. And when you take unplanned time off mid-week to be with the kids, don’t beat yourself up about it. As long as things are getting done, it doesn’t matter that they don’t always fit into neat little pockets of time. I’ve not got a report to back this one up, but my bet is that burnout is one of the biggest killers of productivity. Overdo it and you’ll lose the drive you need to get through a busy working week. Take regular breaks each day away from your screen and your work, build in longer breaks every few days, and holidays every couple of months, if you can. (You don’t have to go anywhere, but the more you can get out of the house, the more refreshed you’re likely to feel). This list isn’t exhaustive, but hopefully it’s given you a little nudge in the right direction. I’ll be sharing other productivity tips on Twitter, LinkedIn, Facebook and Instagram over the next few weeks, so pick your favourite platform and follow me there for more.